President Rivlin attends inaugural awards for contributions to forging partnerships between Israel and Global Jewry. The inaugural ‘Global Impact Awards’ were presented today at a gala event in Tel Aviv, in the presence of the President of the State of Israel Reuven Rivlin, to those humanitarians who have excelled in making a positive impact in the developing world. Among the winners are six Israeli ventures, non-profits, and individuals and two non-Israeli citizens who have contributed meaningfully towards global volunteering, international development, and humanitarian aid while forging partnerships between Israel and global Jewry. The unprecedented awards are a joint initiative of the Society for International Development (SID) Israel, Walla! News and OLAM, an organization designed to help advance the global Jewish service movement that functions as a coalition of 54 organizations dedicated to promoting, enhancing and showcasing the impact of Jewish organizations and individuals in the field of global volunteering, aid and development, alongside several other partners. Among the award recipients were Dr. Georgette Bennett, founder of the Multifaith Alliance for Syrian Refugees, and Jean-Claude Nkulikiyimfura, Executive Director of Agahozo-Shalom Youth Village (ASYV). Jean-Claude was recognized for his ground-breaking work at ASYV, a holistic living and learning community in Rwanda modelled after the Israeli youth village Yemin Orde. ASYV provides an education and a home to more than 500 vulnerable Rwandan youth a year. As of 2018, 80% of alumni were enrolled in or had graduated from higher education programs. ASYV partners with numerous Jewish organizations, including American Jewish Joint Distribution Committee; hosts Jewish volunteers from around the world; and houses a solar field built by the Israeli company Energiya Global. "Under Jean-Claude's leadership, ASYV embodies the values underlying this unique award. Not only has ASYV impacted over 1200 vulnerable Rwandan youth, but it has done so together with Israel and the global Jewish community," said Ginsburg. 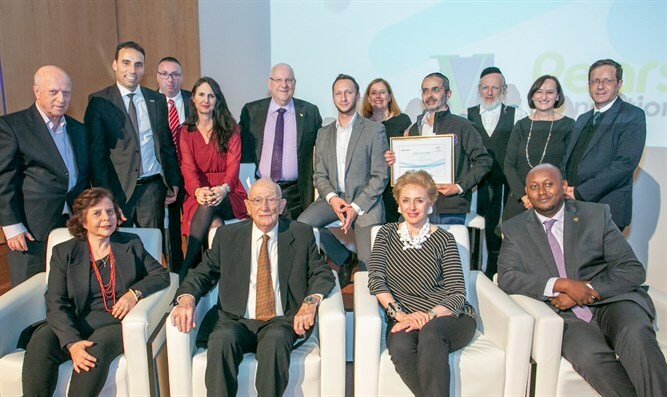 This landmark award ceremony highlights Israel's commitment to international development and to strengthening the relationship between Israel and Diaspora Jewish communities through the work of Tikkun Olam.